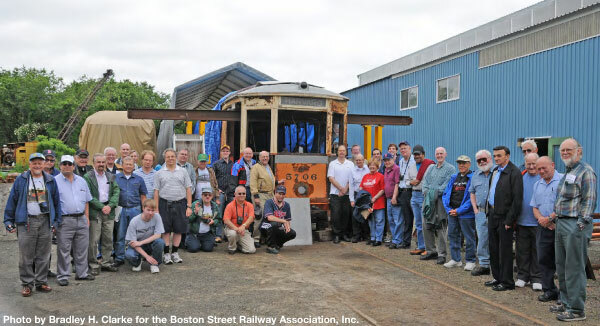 Our 50th Year | Boston Street Railway Association, Inc. When ten young men banded together in 1959 to save a piece of Boston’s history—a streetcar on the verge of being scrapped—they had no idea that fifty years later, their actions would be celebrated by a nonprofit organization of over 900 members. 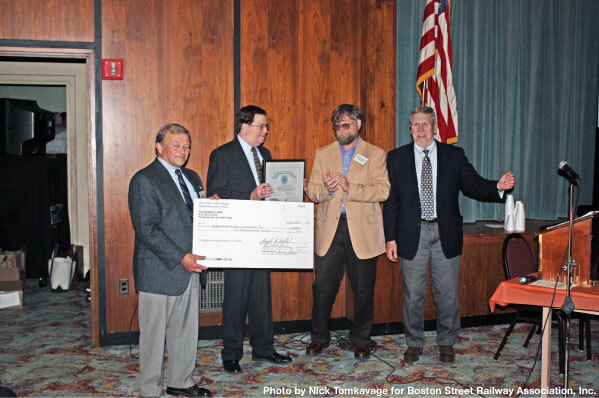 On June 6, 2009, five of the “founding members” of the Boston Street Railway Association joined 150 guests for a memorable and exciting fiftieth anniversary meeting at the Grand Lodge of Masons in downtown Boston. It was an evening of history, a reunion of old friends, and a celebration of continued success. Members & friends pose with Type 5 No. 5706 on June 14, 2009 at Rail Technical Services in Guilford, CT. Here, two hydraulic jacks support the roof while the end vestibule is rebuilt. Likewise, the entire year featured numerous events commemorating the BSRA’s fiftieth year of incorporation. In January, the stage was set with a special 50th Anniversary Logo, along with the release of a letter-sized 2009 Meeting Calendar, featuring the very streetcar around which the Association was formed—Type 5 No. 5706. The calendar was also a nod to a series of popular calendars, illustrated by Stan Genthner, that the BSRA produced for a number of years. In conjunction with the Anniversary, the Association’s website, which had been greatly expanded a few years earlier, received a complete “make over.” In addition to a new design celebrating the famed “traction orange” paint scheme of our streetcar, Type Five No. 5706, new features like a 5706 Restoration Gallery, a video channel on YouTube, and a Facebook group made their debut. The website also played a key role in our 50th Anniversary celebrations, allowing us to quickly communicate special events and information to members. These changes improved online interaction with present and prospective BSRA members and customers, and have set the stage for even more online improvements and interaction in the coming years. On May 2, the Assoiciation held a “final farewell” fan trip celebrating the last ride of the 1976 Flyer Trackless Trolleys. The weather cooperated, and a large group of local transit enthusiasts turned out to say one last goodbye to the historic fleet, represented by coach 4037, which was destined for the Branford Electric Railway Association. The Flyer fleet operated for thirty years on the streets of Cambridge, Watertown and Belmont, and after this trip, were finally completely replaced by modern Neoplan Trolley Buses. It was a great event to kick off the spring, and an event that represents the BSRA’s continued commitment to give life to local transit history. Ex-MBTA Flyer Trackless Trolley No. 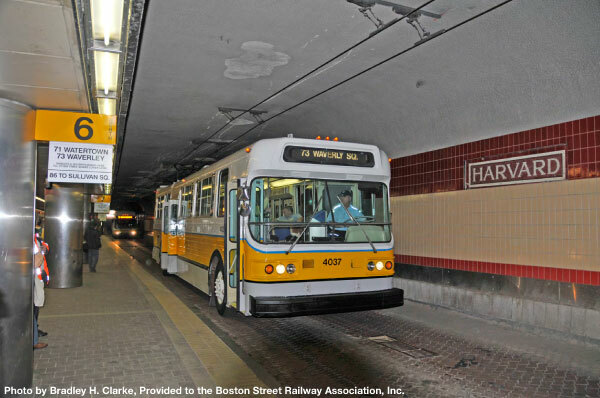 4037 at a photo stop in the Harvard Square upper bus tunnel during a “Farewell to the Flyers” BSRA fan trip on May 2, 2009. Soon after the fan trip, publication of a special edition of the Association’s bi-monthly transit news magazine, Rollsign, celebrated the accomplishments of the BSRA in its first fifty years. The special issue featured histories of the Publications Department, fan trips and special events, and even of Rollsign itself. The highlight, however, was a feature article by four of our founders detailing the events and circumstances that led to the founding of the BSRA in 1959. Dave Harling, Paul Harling, Charlie Reynolds, and Paul Miglierina offered their own recollections and anecdotes about that fateful year, and told the story of how they rescued Type 5 No. 5706 after realizing its potential and its historical significance. The purpose behind this issue, aside from celebrating our fiftieth year, was to create a historic reference documenting the history of the Association itself, and give the next generations of local trolley and transit fans inspiration to continue the work started by our ten founders. The “crown jewel” of the Association’s golden anniversary year—the Fiftieth Anniversary Meeting—came next. While a high turnout was anticipated, a whopping 150 people turned out to celebrate this milestone, including representatives from many area rail nonprofit historical groups. 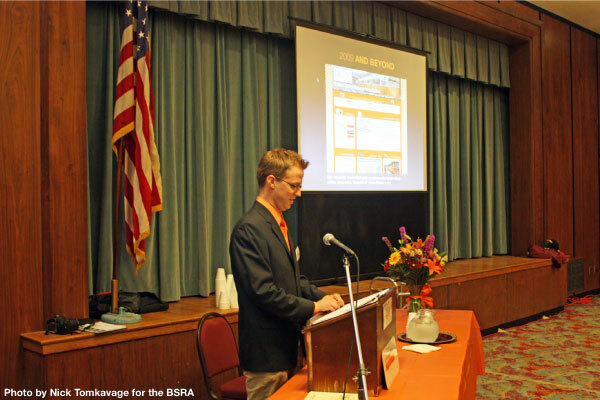 Speeches by BSRA President Bradley H. Clarke, Publications Director and 50th Anniversary Committee Chair Michael R. Prescott, and Rollsign Director Daniel T. Lenihan provided histories of the Association. Founding members Paul and Dave Harling spoke about the Association’s origins and early years, and along with fellow founders Paul Miglierina, Charlie Reynolds, Jr., and D. Robert McCarthy, they received plaques commemorating their role in the Association’s formation. 50th Anniversary Chair and Publications Director Mike Prescott shares the BSRA’s history through a digital slideshow during the Anniversary Meeting. Next, noted historian Ed Anderson provided the crowd with a memorable slide show on public transit in Boston in 1959—the year our organization was founded. Then came a special presentation by the Massachusetts Bay Railroad Enthusiasts (RRE), represented by Leigh Webb, the grant donor, and Bill Crawford, Award Committee Chair, giving the BSRA the annual H. Albert Webb Memorial Railroad Preservation Award—which donated $10,000 to the BSRA for the restoration of the flip-over seats in streetcar No. 5706. The evening was capped off with a commemorative cake and refreshments, and a social hour that offered many a chance to reconnect with old friends, and for several generations of local transit enthusiasts to mingle and share their own experiences. While the meeting was the highlight of the year, it was far from the end of the BSRA’s anniversary celebration. Just one week later, the Association ran a special trip to visit its streetcar “restoration-in-progress,” bringing a busload of members down to Rail Technical Services in Guilford, Connecticut to see the progress of No. 5706 in person. After some time to explore the shop and examine the restoration’s progress, a visit to the Shore Line Trolley Museum in Branford, Connecticut provided an extra historical experience and an opportunity to ride restored streetcars along the museum’s scenic line. 5706 Director and founding member Dave Harling, and President Brad Clarke, receive the H. Albert Webb Memorial Railroad Preservation Award from donor Leigh Webb and President Bill Crawford of the Massachusetts Bay Railroad Enthusiasts. The $10,000 award was granted to assist in the ongoing restoration of Type 5 Car No. 5706. As a final way to celebrate our first fifty years, and after three months of intense work, the BSRA released its 24th Bulletin. Boston Transit Equipment: 1979–2009, written by Michael R. Prescott. This was not only the Association’s first “photo album” book since the 1970s, it was also our first full-color publication and our first publication produced entirely digitally. With the assistance of Brad Clarke and a team of contributors—including Nick Tomkavage, Tadd Anderson, Jim Devlin, Jim Teed, Jonathan Belcher, Danny Cohen, George Chiasson, and Larry Mills—the book was published in late October and has quickly won wide praise and popularity among members and the Boston transit community. In addition to all of these special activities, we also conducted our “normal” business all year long—not the least of which included major advancements in the restoration of car No. 5706! As we enter our 51st year of operation in 2010, and look back on a busy and successful 50th Anniversary Year, we celebrate with our members, thank them for their continued support, and look forward to the centennial of the BSRA!